Lady Isabella Trent is known from Scirland to Eriga as the world's preeminent dragon naturalist, an unexpected and somewhat unorthodox career for a noble woman of Scirland. But before she became famous for her dragon exploits, she was a young woman thrust into society in search of a husband at her parents' insistence, sacrificing her love of books and learning in favor of doing what was expected of her. Little could her parents have known she would land one of the most eligible bachelors in Scirland--or that he would entertain her dreams of studying dragons in far-off lands. 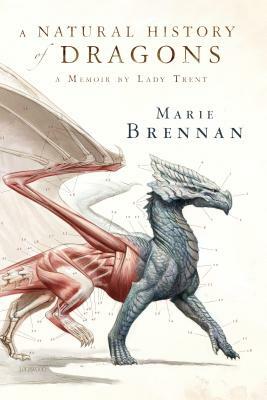 A Natural History of Dragons is Marie Brennan's imagined memoir of this fascinating woman and the creatures to which she dedicates her life. Brennan's skill in developing believable, engaging fantasy steeped in archeological history and folklore is what makes this "memoir" so successful--it is at once as fantastical as it is real. Brennan, writing as Lady Trent, drags readers through lands we have never heard of in search of creatures we have never seen, but never once lets us forget that we are reading about an insecure young woman and new bride, struggling to prove her worth despite her gender and to maintain a ladylike reputation without sacrificing what she loves most. Though dragons may not exist in our own world's history, it is certain that the struggles of women like Trent do, and Brennan captures both with equal elegance in this first volume in the memoirs of Lady Trent. Definitely going on my must-read list. I've been eying it for some time, and your review clinches it. I am excited about thiiiiiis. The title alone would be enough to get me, but it is also an author I've liked in the past. Oh hooray. Oh I can't wait.